, an English divine, the son of the Rev, John Pyle, rector of Stodey, in Norfolk, was born there in 1674, and is said by Mr. Masters to have been educated at Caius-college, Cambridge but his name does not occur in the printed list of graduates. About 1698, he was examined for ordination by Mr. Whiston (at that time chaplain to bishop Moore), who says, in his own “Life,” that “Dr. 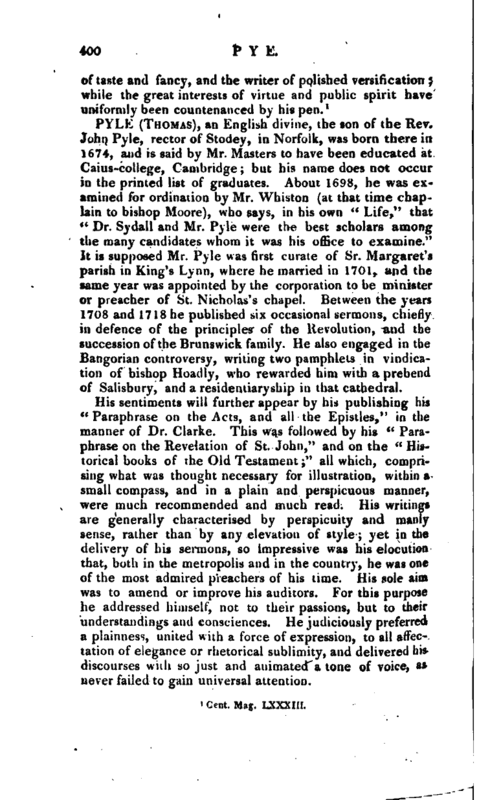 Sydall and Mr. Pyle were the best scholars among the many candidates whom it was his office to examine.” It is supposed Mr. Pyle was first curate of Sr. Margaret’s parish in King’s Lynn, where he married in 1701, and the same year was appointed by the corporation to be minister or preacher of St. Nicholas’s chapel. Between the years 1708 and 1718 he published six occasional sermons, chiefly in defence of the principles of the Revolution, and the succession of the Brunswick family. He also engaged in the Bangorian controversy, writing two pamphlets in vindication of bishop Hoadly, who rewarded him with a prebend of Salisbury, and a residentiaryship in that cathedral. His sentiments will further appear by his publishing his “Paraphrase on the Acts, and all the Epistles,” in the manner of Dr. Clarke. This was followed by his “Paraphrase on the Revelation of St. John,” and on the “Historical books of the Old Testament;” all which, comprising what was thought necessary for illustration, within a small compass, and in a plain and perspicuous manner, were much recommended and much read. His writings are generally characterised by perspicuity and manly sense, rather than by any elevation of style yet in the delivery of his sermons, so impressive was his elocution that, both in the metropolis and in the country, he was one of the most admi /ed preachers of his time. His sole aim was to amend or improve his auditors. For this purpose he addressed himself, not to their passions, but to their understandings and consciences. He judiciously preferred a plainness, united with a force of expression, to all affectation of elegance or rhetorical sublimity, and delivered hi* discourses with so just and animated a torie of voice, as never failed to gain universal attention. | Although he lived in friendship and familiar correspondence with many eminent churchmen, as bishop Hoadly, Dr. Clarke, Dr. Sykes, &c. yet he remained long in a situation of comparative obscurity. This, according to a passage in one of archbishop Herring’s letters to Mr. Duncomb, was, “in some measure, owing to himself; for that very impetuosity of spirit which, under proper government, renders him the agreeable creature he is, has, in some circumstances of life, got the better of him, and hurt his views.” This probably alludes to his being heterodox with respect to the Trinity, which was common with most of the divines with whom he associated. He continued to be preacher at St. Nicholas, King’s Lynn, till 1732, when he succeeded to the vicarage of St. Margaret, which he held till 1755. Being then no Jonger capable of discharging the duties annexed to it, he gave in his resignation, both to the dean and chapter of Norwich, and also to the mayor and corporation of Lynn, early in the summer of that year. He then retired to SwafFham, where he died, Dec. 31, 1756, aged eighty-two > and was buried in the church of Lynn All Saints. 1 Nichols’s Bowyer, vol. IX. p. 433. 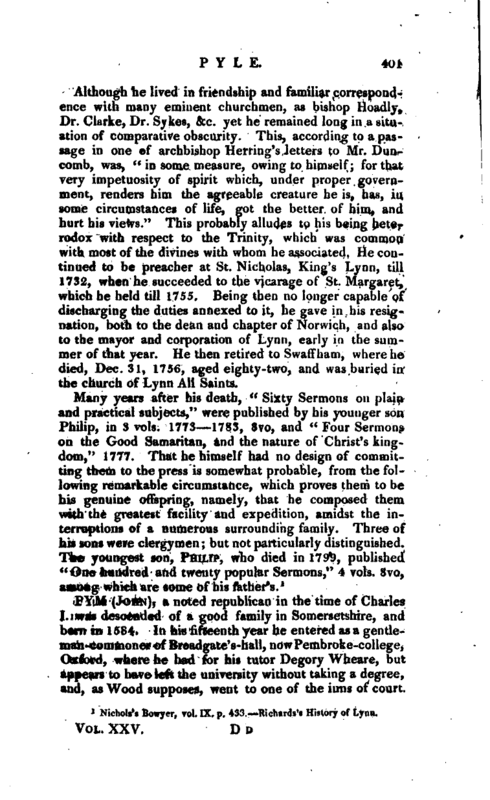 Richards’s History of Lynn.